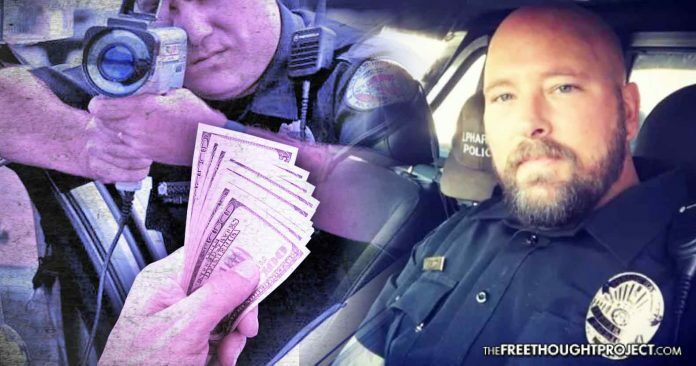 A police officer who was fired for refusing to write mandatory citations is now speaking out about the problems caused by "policing for profit." Capps said his philosophy allowed him to give “a lot of warnings,” but added, “if they needed a ticket they would get one.” He said if citizens were “courteous and they understood what they did wrong, I wouldn’t write a citation.” The fired officer also said he treated automobile accidents the same way, but that was not good enough for his superiors. According to an internal memo uncovered by CBS46, all officers have now been instructed to issue criminal citations for all accidents, including minor fender-benders where no one was injured and where minimal damage occurred. Those kinds of citations drive up the already high costs of automobile ownership by increasing insurance premiums. Alpharetta city councilman Dan Merkel said his daughter also got caught up in the mandatory ticket writing scheme. “There was no damage to her car and no visible damage to the other car, but she got a ticket for following too close,” he said. Predictably, Capps said he has not been able to find work in another police department as an officer. Maybe he is too honest for police work, or maybe policing in some police departments has become “policing for profit.” Such is the catchphrase for the phenomena of writing tickets as a way to generate income for police departments. One such case of policing for profit was caught on body camera video and cell phone footage and immediately went viral. In early 2017, a police officer in North Enid, Oklahoma, decided to write resident Kali Wood a ticket for stopping on the side of the road to speak with her friend, Physical Therapist Gary Duckworth. Duckworth gave Officer John Miller an ear-full of complaints, followed by promises of getting him fired for harassing him and his friend for the crime of stopping on the side of the road to greet each other. Miller responded by threatening to Tase Duckworth for confronting him and his decision to write a ticket. In an exclusive interview with The Free Thought Project, Duckworth said the harassment from police was reaching epic proportions in North End, with many residents getting ticketed for frivolous infractions of the law such as speeding just a few miles above the speed limit. Duckworth even threatened to “run for mayor” so that he could take back his town from what he believed to be an out-of-control police department. Policing for profit is a very real phenomenon, and it has painful consequences. Not only were residents in Alpharetta having to pay already high insurance rates but as Capps revealed, they were also faced with misdemeanor criminal moving violations charges. Fortunately, one officer decided to say enough was enough, but he paid for it with his own job. So where are all the good police departments now that an honest officer is looking for work? America needs more officers like Capps and fewer who are wiling to cite a neighbor for stopping to say hello to a friend.